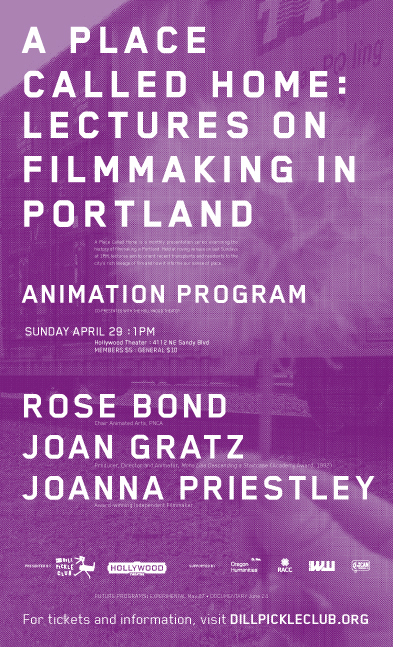 Join Rose Bond, Joan Gratz and Joanna Priestly for A Place Called Home, a lecture on filmmaking in Portland on Sunday, April 29, 1pm at the Hollywood Theater. Presented by the Dill Pickle Club, A Place Called Home: Lectures on Filmmaking in Portland is a monthly series examining the history of filmmaking in Portland. Held at roving venues on last Sundays, the lectures aim to orient recent transplants and residents to the city’s rich lineage of film and how it informs our sense of place.